Property 11: Bach near the Beach in Prime Position in St Clair. Beautiful Villa Accommodation in lovely garden setting. Decorated with flowers. Property 18: Beautiful Villa Accommodation in lovely garden setting. Decorated with flowers. Self contained apartment with panoramic views! 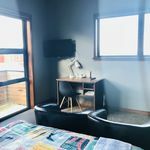 Property 19: Self contained apartment with panoramic views! Sea & beach views with safe swimming 15 min north of Dunedin. 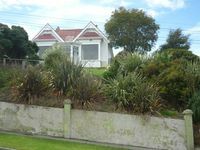 Property 27: Sea & beach views with safe swimming 15 min north of Dunedin. 'Highcliff' - Spectacular ocean views! Property 37: 'Highcliff' - Spectacular ocean views! We travelled with two children and found this property to be perfectly located for us to get easily into town and the sights. The owners were lovely to deal with and even had the heat pumps and lights on for us for when we got in late. Lovely cottage with all the facilities that you could require.